Sunday on our way out of town, T and I stopped at the state fair for lunch with my parents. 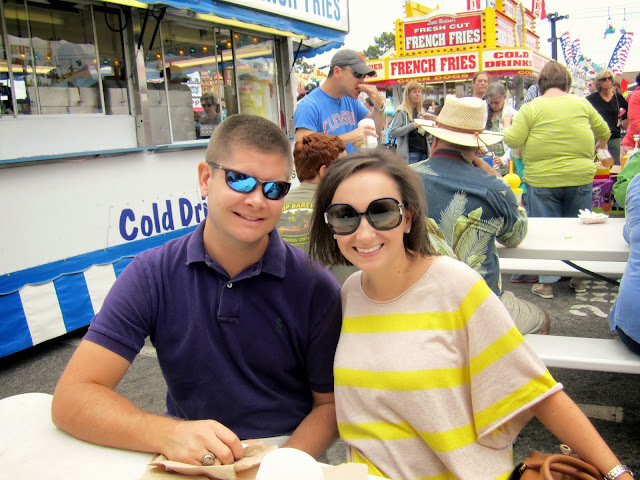 T and I love the Upstate, but we do miss Columbia's state fair in all of its deep-fried glory. 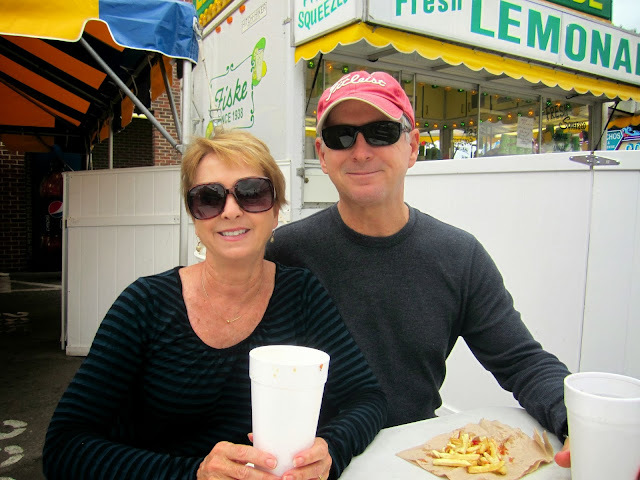 We started our lunch with Fiske french fries; the best fries at the fair. 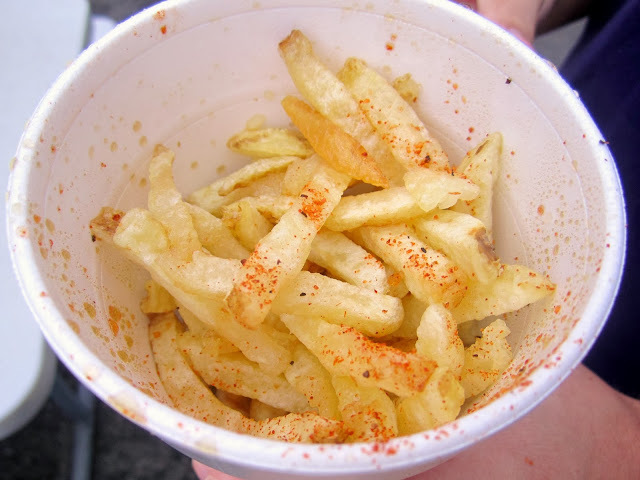 They're shoestring cut and come with the options to add malt vinegar and seasoned salt. We added both, naturally. After our french fries (and a not pictured corn dog) we walked around looking at all of the games and rides. I don't know how I ever got on some of those things when I was younger; just looking at them made me want to hurl. Nonetheless, it was fun to walk around and look, and to hear the occasional "somebody scream!" accompanied by 30 or so tweens yelling at the top of their lungs. If you've been to a state fair, you know exactly what I'm talking about. 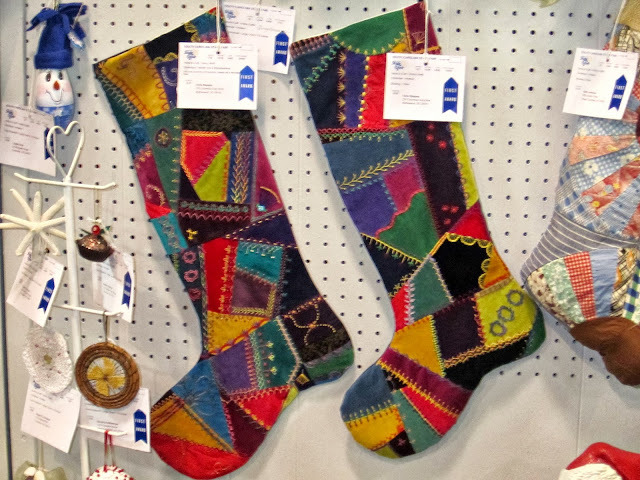 My mom is a really talented seamstress and enters things into the fair every year. This year she entered these two Christmas stockings. You can't tell from the pictures, but they are made from all different kinds of velvet and brocade fabrics. She then hand embroiders all of the details onto each one. It's a very time consuming process, but they turn out absolutely stunning. This time last year T and I asked her to make stockings for the two of us, and this is his on the left. We were thrilled to see that both of the ones she entered won blue ribbons! 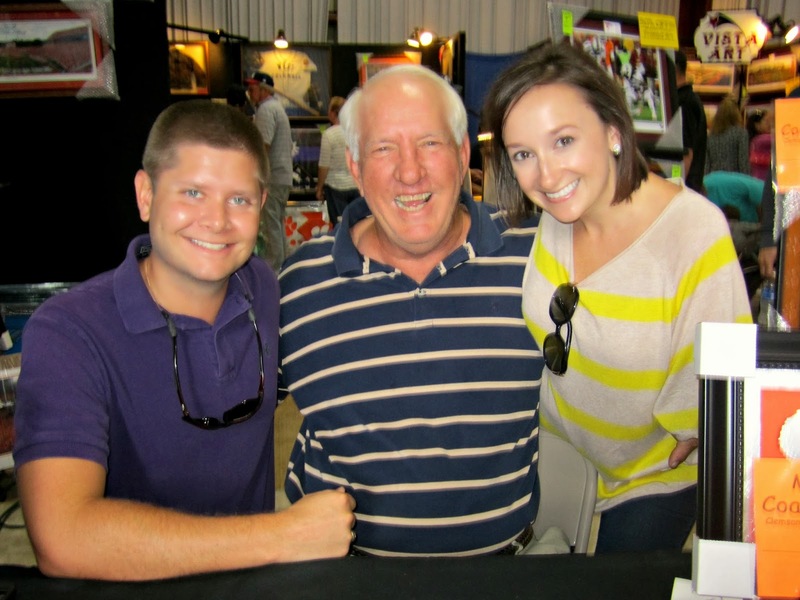 We also ran into Danny Ford, Clemson's football coach for the 1981 National Championship team and had to snap a picture with him. I do believe this was T's highlight of the day. 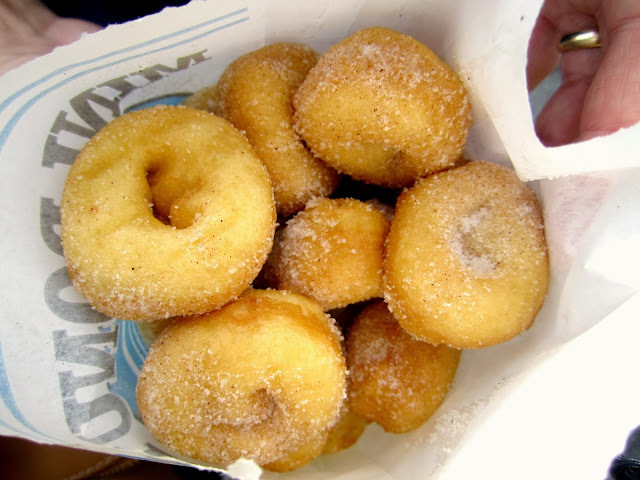 We ended our fair visit with a bag full of mini doughnuts. It's my family's tradition to always get an elephant ear, but T has always gotten the mini doughnuts. Essentially its the same thing, fried tough coated in cinnamon sugar. So in an effort to blend our family traditions we opted for the mini doughnuts this year, and they were quite tasty! I'm so glad that we made time to swing by the fair this year. There is no other place that I can go and justify eating that much fried food! I am going Sunday! I don't like rides either, but like to go walk around every year. I grew up around Clemson and I think Danny Ford and I used to use the same vet. I'm not sure if he had cows or horses, but I was at the vet's with my horse when I was in 9th grade and saw him a few times. I went to my first fair last month in Los Angeles! 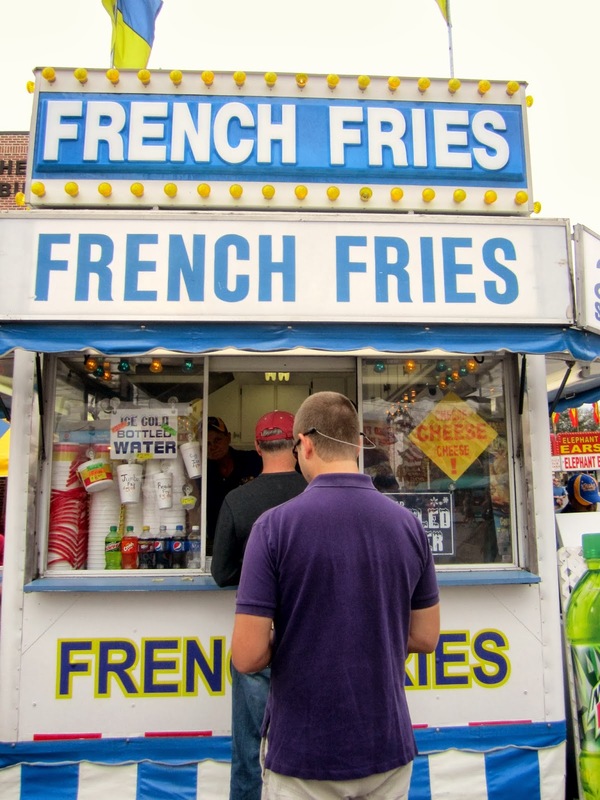 I want to go to the midwest or south and go to a "real" fair! so, so fun! 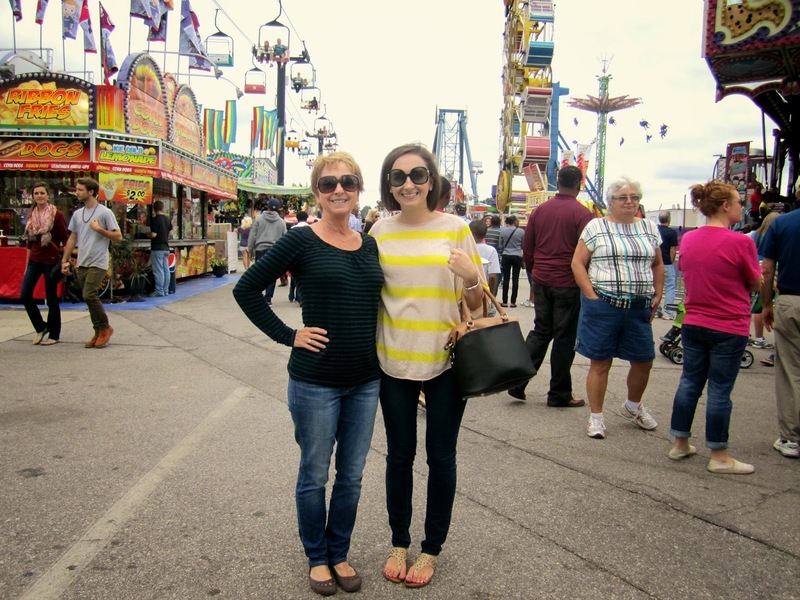 i love fairs!!! makes me want to pop up to raleigh for our state fair!!! eeee! love the pictures. I've never been to the state fair but I've heard its much better than the one that comes to Charleston. I'm the same way about rides now. I used to love them but can't imagine riding a single one now, they just don't look safe! I love elephant ears but those mini doughnuts look yummy too! Your moms stockings are so cute! So glad to hear she won a blue ribbon!